Slot Social is one of our most popular games! It's also a great "starter" game because it's pretty easy to understand. Here's how it works! Each room holds up to five players and each player has a personal slot machine. 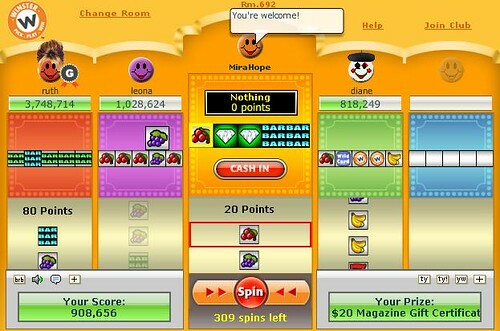 Instead of pushing a button to spin multiple reels like a regular slot machine, in Slot Social you click "Spin" to get one piece at a time. (Hitting the Enter key works too.) The current value of your hand is always above the slots! When you're ready to collect your points, hit the "CASH IN" button. This clears all of the pieces on your board and you start fresh! Now the fun part about Slot Social is that you can trade pieces with other players! It's really easy to do. Click on a piece on your board that you want to trade, and then click on the piece that you want. The other player will see a Yes/No balloon pop up next to the piece you requested to trade. If they click "Yes" the pieces will switch places. That's it! If you have a hard time seeing the tiny icons on another player's board, just move your cursor over the pieces. Instant magnification! Use trades to build the best hand possible and then cash it in for points! How do you know what pieces to keep? You look at the paytable, of course! The following table lists all of items and their values. 3x means three of a kind. 4x is four of a kind, and 5x is five of a kind. Don't forget that Club Winster members get four times the points! 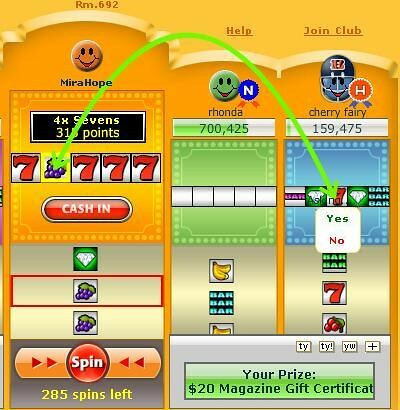 The Winster Logo is almost always called a "Winnie" in Slot Social. When someone says they're trying to get a jackpot (or JP) it means they want to get 5 Winnies. IMPORTANT TIP #1: Five wilds are NOT the same as five Winnies! Wild cards on their own have the same value as diamonds. IMPORTANT TIP #2: Wild cards latch on to whatever you have the most of, even if it's worth less than another combination! Take a look. Here we have two wilds, two cherries, and one Winnie. Since we have more cherries than Winnies the wilds "stick" to the cherries. This turns the hand into 4x cherries for 50 points and not 3x Winnies for 500 points! Wilds are often saved up to to create a Winnie jackpot. Winnies are pretty rare, and the wilds really help! Also, sometimes people talk about "playing JP." This means that everyone in the room takes turns getting a jackpot. Whenever someone in the group gets a wild or a Winnie they give it to whoever is supposed to get the jackpot next! You don't have to give anyone your pieces! But if a room is playing JP and you don't want to do that, you should probably switch to another room. Whenever possible hit "Cash In" only when you have five of a kind. 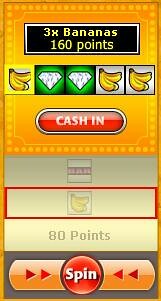 If you're playing at an odd hour and the rooms are empty, well, you may have to cash in with 4x or even 3x. But if there are people around, trade trade trade!! Winster is all about helping each other achieve high scores! Sometimes you'll get a great piece that you want to hang on to, but you already have 4 of a kind going on. You definitely don't want to spin that Winnie away! If only there was a way to hang on to that Winnie and keep spinning! Good news! There is a way, but it involves a bit of trust on your part. You can ask another player to "hold" a piece for you. If they says yes, trade the piece. (You'll want to trade to either an empty spot or for a low value piece, like fruit.) Once you get the piece you need and cash in, they'll trade the GOOD piece back to you. Most people only ask others to "hold" wilds, Winnies and occasionally 7s. About 99% of the time they get the pieces back. For the remaining 1% the other player might lag, lose connection, or flat out keep the piece. It's rare for this to happen, but don't let it ruin your fun! IMPORTANT: If you don't ask someone to "hold" before you trade, don't assume they know you want the piece back! This mnemonic (a memory trick) groups the items from highest value to lowest. It's an easy way to keep track of things! Generosity is contagious. Really! It's okay to ask someone to hold pieces for you, but you should also consider just giving valuable pieces away. Why? Well for starters, it's a nice thing to do! Secondly, when you?re generous with your pieces, other players will be generous to you! It's such a simple thing to do but it makes a huge difference! If you never say "Thank you" you appear ungrateful, and people may not want to continue trading with you. Take a second to click the button and everybody wins! That's everything! You're ready to tackle Slot Social now, so give it a shot!